Thanks to its improved folding mechanism this modernised Quinny pushchair folds to a compact size without the need of removing the seat unit in forward facing position; ideal for parents with little storage space or a small boot. Featuring a lightweight frame, it is easy to carry and is a suitable travel companion on trips, public transport or a shopping spree in the city centre. The Zapp Xtra² was designed with one idea in mind: to make your life easier. This versatile pushchair is suitable for newborns if used with Quinny From Birth Inlay (sold separately) and Maxi-Cosi baby car seat. 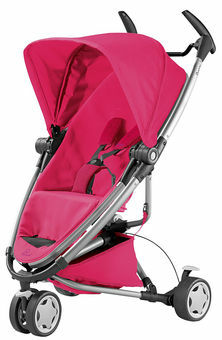 When used with just the seat unit it is suitable from six months to 15 kg (approximately 3.5 years). Its fully adjustable seat unit can easily be changed from parent to world facing and features multiple recline positions for your baby’s comfort. In a few simple clicks it transforms into a travel system compatible with colour matching Maxi-Cosi Pebble car seat. The Quinny Zapp Xtra² comes with all the accessories you need when out and about. Supplied with an extendable sun canopy you can enjoy a relaxed stroll on a sunny day or use the provided raincover in case it starts raining while running errands. Featuring a lightweight frame, the Quinny Zapp Xtra2 is a suitable travel companion on trips, public transport or a shopping spree in the city centre. The Zapp Xtra² was designed with one idea in mind: to make your life easier. A travel bag (sold separately) is also available for easy transportation when travelling. The seat unit is reversible and has 2 world and 3 parent-facing recline position to ensure your little one sits comfortable whether they are wide awake or having a snooze. It also features a pop out footrest to provide added comfort when seat is reclined. On sunny days you can just use the zipper on the sun canopy and extend it even further. Supplied with adapters, parents can easily transform their Zapp Xtra2 into a trendy travel system compatible with Maxi-Cosi Pebble Plus, Pebble and/or CabrioFix car seats. Maxi-Cosi developed a special range of Pebble that matches appropriately with the colours of the Quinny collection - allowing parents to create a matching travel system. The Zapp Xtra2 is ideal for parents with little storage space or a small boot. It features two different folding option: A quick everyday fold with seat unit attached in world-facing mode and a compact fold without seat unit attached. The frame locks automatically when folded. The large shopping basket can hold a weight of up to 5 kg and provides create storage space for your baby's everyday essentials. This pushchair also comes with a large sun canopy, raincover, detachable parasol clip, car seat/carrycot adapters and five-point harness.